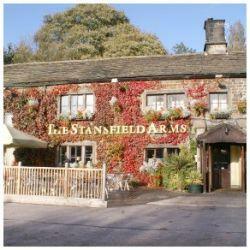 The Stansfield Arms dates back to 1543 and is a beautiful beamed historical pub and restaurant. Set in the idyllic Apperley Bridge area, near the River Aire and open countryside it is popular with walkers, cyclists, dog owners all year round. Suitable for all occasions, a meal for two, a large family occasion or a quick drink on the patio.Perfect in the summer on our very large south facing patio area and cosy in the winter by our open fires.We serve good home made food, nice wines and real ales. Mon - Thurs 12.00 - 24.00, Fri & Sat 12.00 - 01.00, sun 12.00 - 0100.